P.S. Jasper meets the sheep here. Oh Jasper, you are utterly adorable! Ha, SassyCat sounds like Jasper's dream girl. He is the most talkative (and loud) cat I have ever met. Last night I woke up and could clearly hear him meowing his head off out in the farmyard, and we sleep on the second floor (granted the windows were open). He was bored. None of the other cats will play with him yet, mostly because he keeps launching himself at them in attack mode. ;) (He's very young.) 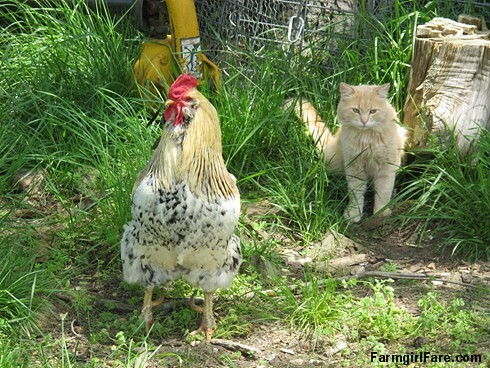 This morning I did spy him and beagle Bert sitting together in the farmyard being all chummy. Progress! 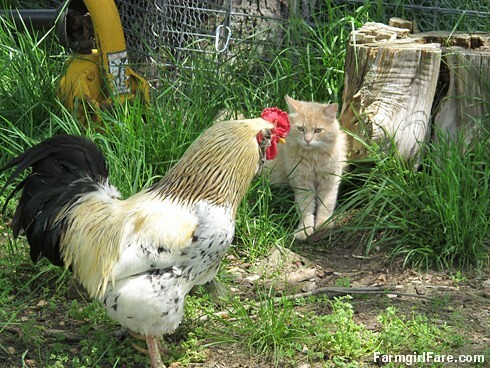 I think Rooster Andy won that stare down. Rooster Andy keeps order. These pictures are beautiful. Sounds like Jasper's really making the rounds! He's such a pretty kitty and pretty lucky to have such a beautiful spot to get accustomed to. What a cutie! He'll find his way and soon be everyone's best friend. Jasper is truly a keeper! 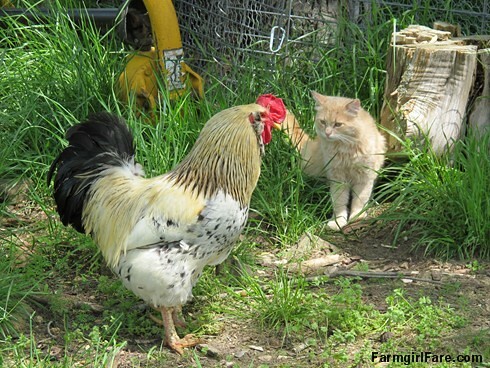 I'm intrigued with him meeting Rooster Andy (you know, cats & birds???). Rooster Andy is one very handsome fellow! Adorable. Thank you. You gave me a smile for the day. 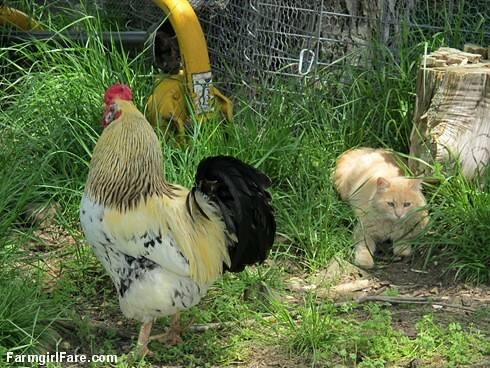 I think he is a smart cat; that rooster knows that he is boss. 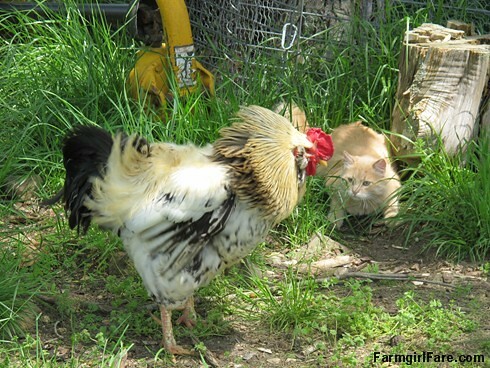 This is a nice shiny rooster! Of course, Jasper is as equally beautiful. Would you mind telling me what breed Andy is? 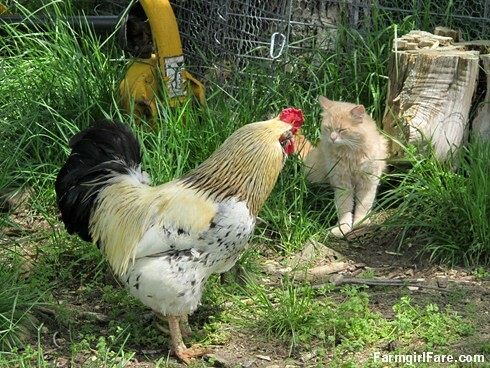 I will be getting chickens next spring. Andy is just a good old Missouri mixed breed. 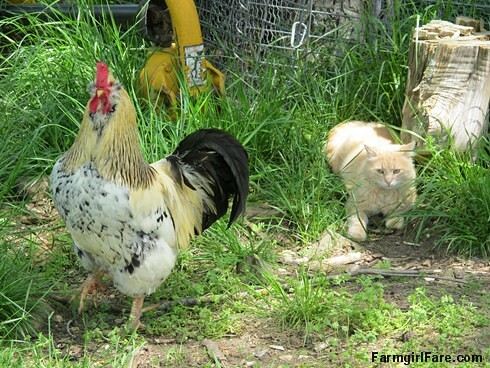 All of our chickens are related to the seven chicks that Whitey hatched out back in 2007, when a friend brought broody Whitey a dozen green and brown fertilized eggs from her mixed flock of hens.